or for an introductory high school foods course in a two-course sequence. Food preparation is thoroughly covered in the special Food Preparation Handbook at the back of the book. Many teachers find Nutrition & Wellness appealing for traditional foods and nutrition courses as well, because of its upbeat, student-friendly approach and its high-impact visual design. 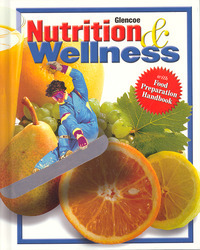 The text's positive approach emphasizes enjoyment of food and physical activity. Nutrition information is geared toward teens. Motivates students to learn to make wise food choices for active living and weight management. Emphasizes enjoyment of food and fitness while promoting personal choice. The Food Preparation Handbook offers maximum flexibility for teaching food preparation skills, and food science principles.